In an acronym-laden report, MONUSCO has announced the latest developments in operations against the Allied Democratic Forces (ADF) and the Democratic Forces for the Liberation of Rwanda (FDLR). Activities against the ADF have included several exchanges of fire between rebels and Congolese military (FARDC) forces, with the Force Intervention Brigade (FIB) participating in an auxiliary role. The combat operations against the ADF, FDLR and other groups in the Eastern DRC are grouped under a new joint operation called Sukola (Lingala for “mop up”), with two simultaneous sectors – one in North Kivu against the ADF and the other in South Kivu against the FDLR. For the past six weeks the FARDC, assisted by MONUSCO, has conducted operations against the ADF in a triangle formed between the axis of Beni, Kamango and the eastern boundary with South Irumu. While the Force Intervention Brigade has not, as yet, been involved in direct combat against the ADF it has provided logistical and intelligence support to the FARDC forces in the area and set up additional protection positions to free up FARDC troops for combat operations. The FARDC believes that these operations have inflicted an estimated 300 ADF casualties thus far and claim it has significantly weakened the group. FARDC has also captured the key ADF strongholds of Mamundioma (50 km north-east of Beni) and the ADF’s main training base at Mwalika. 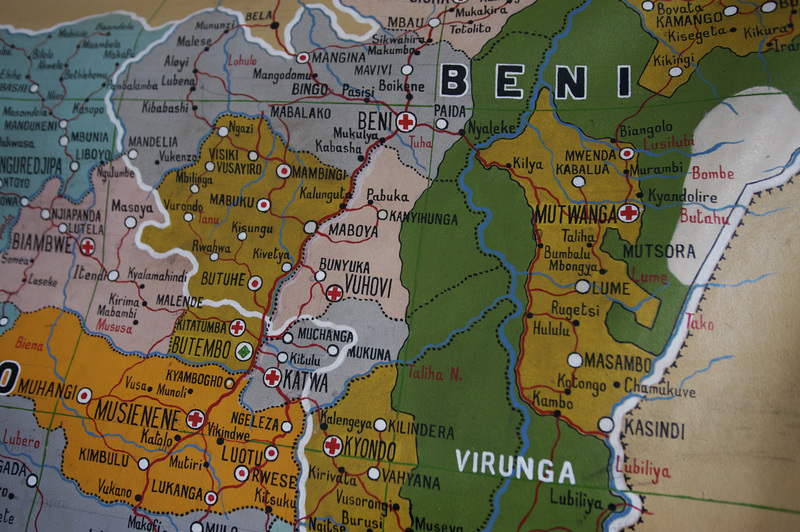 The portion of operation Sukola directed at the ADF has been focused on the group’s territory in a broad triangle between Beni, Kamango and Irumu. MONUSCO has also contributed the use of South African Rooivalk attack helicopters for fire support to hit entrenched ADF positions. A Rooivalk sortie against ADF positions was launched at 14h55 local time against an ADF base at Saha Sitisa northeast of Beni, during which two Rooivalks fired several salvos of 70 mm FFAR unguided rockets and used their 20 mm cannons. On 2 March ADF launched an attack on FARDC forces near Nadui (about 20 km from Beni) which resulted in two FARDC troops killed and three wounded, with an estimated seventeen ADF troops killed and one taken prisoner after the FARDC successfully repelled the attack. There remain suspicions that ADF is using insurgent tactics against MONUSCO and FARDC forces, including the use of improvised explosive devices targeting convoys and other ‘soft’ targets. Non-essential UN staff have already been evacuated from Beni and relocated to Goma. 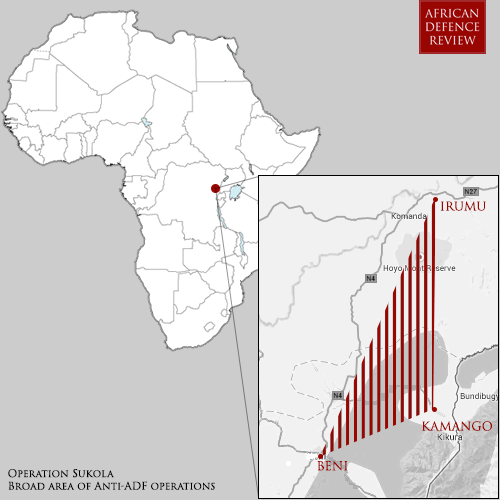 On 3 March, a firefight erupted between FARDC and the FDLR-supported Mai Mai Nyatura in Kivuye some 6 km North of Mpati. The FARDC forces achieved an overall victory in the engagement, forcing a Nyatura and FDLR retreat from the area. On the morning of the same day, FARDC and the FDDH (Force for the Defence of Human Rights), an allied militia group, engaged each other 6 km North of Mpati. This occurred as FARDC forces were moving from Bweru towards Kivuye, achieving the displacement of FDDH fighters in the process. These engagements will be the next significant test of the FIB forces, as they continue to support FARDC forces in offensive operations against major armed groups in the Eastern DRC. Logistical and air support and intelligence assistance has allowed the FARDC to operate more freely than before and effectively target multiple armed groups simultaneously, coordinating actions across multiple fronts. Disarmament, Demobilisation and Rehabilitation (DDR) operations are also being further pursued, although progress remains underfunded and partial at present.